One of the breakout features of Google+ — and the one I believe will ensure Google’s continued growth — is the seemingly simple Hangout. At first glance, it looks like just a video chat made easy, but once you start looking at the dashboard, its true power becomes apparent. 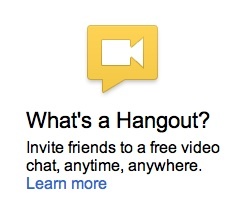 When you create a Hangout, it can be public or invite-only. If it’s public, it can also be On Air. That means that even if the Hangout is full, it will still be broadcast to anyone who cares to watch. The really great part is that you can archive a recording of the Hangout to your YouTube account as a private video — to share at your discretion. Think about the potential. A book author could have a Q&A with readers and then embed the resulting YouTube video in his/her blog or social media platforms. Training sessions with cyber-commuting staff could be archived for future new hires. The possibilities are virtually endless. What about people who are not on Google+ or do not have a webcam? Well, the Big G has that covered as well. There is a relatively new feature that allows those users to dial in from a landline or cell phone. They won’t have video, but they will at least have the option to participate. Much like Skype, OoVoo, and Facetime, Hangouts can allow you to have business meetings with clients no matter how geographically apart you might be. Unlike with the other platforms, you can have up to 10 people in each Hangout, allowing for larger meetings. Product demos can be great for creating sticky content. Use Hangouts On Air to record and archive them to YouTube. Then you can post the link along with the product description or other listings. It also provides a piece of multimedia content for bloggers that might write about said product. Since Google+ is still fairly new, it is notable to be one of the few businesses leveraging it. While there is a good bit of commentary about it being a low-engagement wasteland, I am skeptical of that view. A lot of the content is shared to limited Circles and is not measured. Add in its ubiquity, especially when signed in to any Google properties, and I feel safe in predicting it will be around for awhile. Wouldn’t you like to be on “the cutting edge”? Growing your Circles is also facilitated by using and archiving Hangouts. A notice that they are Hanging Out appears in each user’s stream when they join the video chat. This creates another option for discovery that can draw in new people. If you want to get started with Hangouts and have no familiarity with them, I advise Serenety Caldwell’s excellent tutorial on Macworld. You might also want to check out Google’s help pages on the subject (which include more recent features such as On Air). Lastly, if you’d like to try participating in a few Hangouts before you start running your own, there is a consolidated list of Hangouts that are currently live on GPHangouts.com. Image by AJC1(AJ Cann), used under its Creative Commons license.